God is in us creating the will in us to be like Jesus. We don’t really want to be like Jesus in and of ourselves. We want pleasure, personal peace, possessions, and even power and privilege. The scriptures make it clear that none of us are righteous, none of us seek after God, and all of us have gone astray. We don’t want to be like Jesus. But it’s God who brings about a change in what we really want in life. 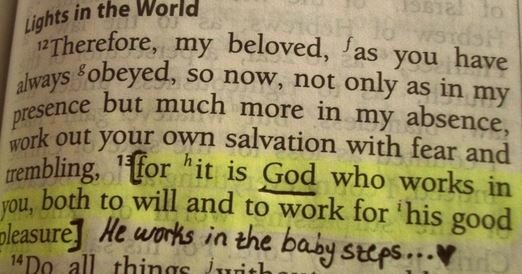 God has to do a work in our wills before we can achieve any kind of spiritual growth. I have good days and bad days with regard to what I really want. The Psalmist did too. In Psalm 119:36 he prayed for God to change what he wanted. He prays, “Turn my heart toward your statutes and not toward selfish gain.” Psalm 37:4 teaches us to, “Delight yourself in the LORD, and he will give you the desires of your heart.” Some suggest this means God will give you the things that you desire in life, wealth, popularity, pleasure, etc… But when God gives you something it is something you don’t have. If He gives us desires, He gives us the desire itself to do what He wants us to do. The will to be like Jesus in His humility and obedience has to come from God. And so does the power to do it. 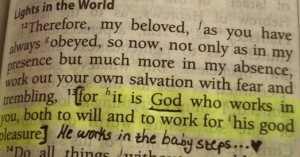 The word in our verse for “work” is the word for energy. Sometimes I find myself wanting to do the right things, wanting to be humble and gentle and obedient like Jesus, but find I don’t have the ability in certain situations. But God promises not only to work in the right kind of desires but to also work them out. Augustine wrote, “God makes us do what he pleases by making us desire what we might not desire.” Specifically with the church at Philippi, Paul argues that God wants them to put an end to the dissensions among them through living out the humble and obedient example that Jesus set for them. He wants the same thing for us today!